The CAGED system is only one part of mastering the fretboard. It acts as a guide, like a visual cue for finding your way around the guitar fretboard. Guitarists that have complete command of the neck are always the ones that sound professional. It’s one thing knowing scales, and they certainly are useful for soloing and creating melodies but when you want to create a guitar solo that really fits the music and makes you the envy of other guitarists then you have to know what you are doing. This is no easy task and takes some practice. Understanding it is one thing but applying it is another. Sometimes the two go hand in hand and things don’t really click into place until you get past a certain stage. I used to envy my friend, a guitar teacher, no matter what I played he could always improvise and throw something over the top of it that not only sounded fantastic but also sounded like he had spent weeks preparing. No matter how many times he told me what he was doing, it just wouldn’t sink in. The problem was I was looking for the wrong answers. The reality is you just build up to it but you have to do so in small steps. The true power of chord tone soloing and mastering the fretboard comes from practicing the right things in the right order. The reason so many of us guitarists never get there is because when we are shown what to do, we think there must be something more. If you want to master this skill then it’s actually not anywhere near as hard as it sounds, but it does take some time and practice. I have been meaning to write a whole bunch of lessons for this (The practice sessions) but never get the time to organise a good practice schedule. But there’s some good news. I have found a book that shows you not only everything I wanted to say in those lessons but much more and much better. It’s called Chord Tone Soloing by Barrett Tagliarino. The book takes you through a complete journey of mastering the fretboard and making use of chord tones to create melodic phrases and powerful sounding solos that will make you the envy of many guitarists. Everything from simple chords to CAGED to arpeggios and more. This is the stuff you not only need to know but you need to practice in such a way that your brain soaks it up and spits it back out on autopilot. The book is full of TAB’s and examples along with an accompanying CD for practicing along with. Most of the content is reasonably simple. There’s no blazing fast solos to learn or difficult techniques. The book is about the notes you play, not how to let rip a squealing harmonic or fly across the neck with blurred fingers. The aim of the book is to put you in full control of the guitar, the chords and note choices, one step at a time. Like it or not this is the best, quickest and most efficient way to master the fretboard and take control. You will not master this skill overnight but if you stick with the practice and do exactly what the book is telling you to do, no matter how simple or boring it might seem at first – you will be on your way to the next level, pretty much guaranteed. This book goes way beyond CAGED. 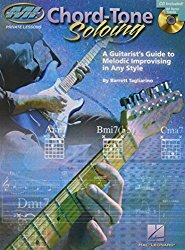 If you want to be able to improvise guitar solos over virtually anything and always sound like you know what you are doing then the answers lie in this book. I really can’t recommend it enough. I couldn’t agree more about Barrett Tagliorino’s Chord Tone Soloing book. I came across it in a small music store a couple years ago and had one of those ‘aha’ moments. Knowing the names of the notes is a must to get this to work, but you can see it all take shape pretty easily even if you only know some of the notes when you start. Yeah man I actually wrote a pretty long review for this book an Amazon a few years back.. I believe I said something like this was the missing instruction manual for your guitar. Most guitar players learn scales and modes and then try to force them over a chord progression. This works OK in a lot of situations, but it has a way of becoming tired sounding after awhile. The problem with this is the player isn’t focused on the chord changes. This book forces us to stay in tune with the music by actively working to play notes made up of chord tones… Yes you are still going to be playing scales etc, but you will be doing it with a complete awareness of the music underneath you making it much easier to land on a chord tone at the correct time. Eventually you will trancensd even thinking about chord tones. You will just be aware of the music and your fingers will know what to play, but the ONLY way to get to this point is to practice like this book suggests. really can’t recommend this book enough. After scales, chords, modes, licks and chord/scale investigations- finally respect for melody was impressed upon me. Studies of melody revealed Voice to me. Honouring the melody brought a deeper integration of intent and honesty to my playing and soon I began to discover my own voice. Like a lawyer or a doctor has a practice, I am a practising musician. I honour the dialogue with an inner other, my muse, which is simply the next sounds I hear in my mind as I play. Of course I still have to stop and think and figure stuff out at times – to break it down- and of course I still have to transcribe or lift new stuff which I admire from other players. Now, however, I play more honestly and my own voice comes through.